← Market Timing Brief for the Gold ETF (GLD) and 10 Year Treasury Yield (TNX) Closes On 4-17-2014: As I Said. 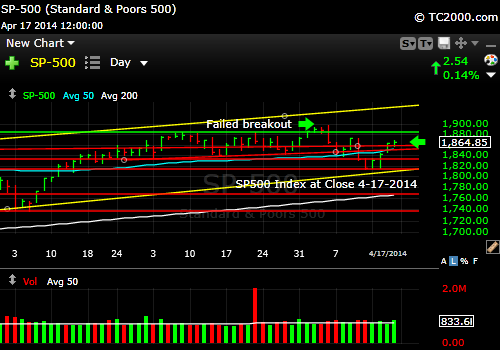 Market Timing Brief for the SP500 Index Close on 4-17-2014: Bouncing How High? The SP500 Index (SPX, SPY) close last Friday marked the low. The market has since bounced more than halfway back to the green line on the chart below, which represents the prior breakout point. Earnings have been mixed and despite that, we have this strong bounce, which is a positive for the Bulls. The market began bouncing even before Janet Yellen spoke and the Beige Book economic report came out on Wednesday. On Thursday, the final market day of the week, the SPX even sloughed off mediocre results by Google (GOOGL). This means there are still buyers waiting for these dips and containing their depth. Clearly the market can re-top in a day or two. Then the yellow channel line comes into play. There is a good amount of resistance built up at that green line, so if we go over it, be sure to be impressed! I sensed the risk of selling the low, so we rotated assets into other indices that should outperform the U.S. market this year, rather than selling partial positions at the low and holding cash. More than half way back in the current bounce. Sentiment was fairly Bearish this past week, and you can catch up on current investor sentiment on the “WSSSR Access” page and what it means for this bounce, after you subscribe: Free Subscription to My Newsletter and access to my latest comments/strategy I’ll send you back the password to the access page and the weekly newsletter in the same email.